Big day today, so set off early at 7am. This was our first +100 mile day. It also included the 2 largest climbs of the ride – Slochd and Drumochter. I was looking forward to both of these – I’ve wanted to cycle them for some while now. Unfortunately, Shaun appeared to be a little under the weather. The day started OK with cycle route (mostly traffic free) from Dingwall to Inverness. Then we followed a route suggested by 14th man which took us out of Inverness and on to Route 7, and kept us nearly traffic free right to Aviemore. By now Shaun was not well. He enclosed himself in his MP3 player (I thought this may help him). In truth I suspected the energy gels he was using, and suggested he lay off them. After we stopped for tea at Tomatin we set off again and started the long climb up Slochd. Fantastic climb and with grand views, but every time I turned around, Shaun was staring at the tarmac directly below his wheels. Periodically I stopped, so we didn’t get too far apart, and we finally arrived at the summit. This is 1300 feet, and we had climbed it from Sea Level – making a total climb of, erm, 1300 feet. Route 7 briefly arrives at the A9 at the summit, but there’s a segregated cycle path which takes you though the cut in the mountain that the A9 goes through. This then descends on what used to be the A9 before it was upgraded. This road is almost traffic free, and leads you down to Carrbridge. Carrbridge is a little village with a Wade Bridge in the middle. We could have stopped to take a photo, but because it was a big day we didn’t. It was raining at this point, so the picture wouldn’t have been that good anyway. From here we followed the back road to Aviemore. I really enjoyed this ride, but Shaun was still studying the road directly below his wheels. We arrived at Aviemore in time for lunch, and there are some nice benches to sit on. I ate my pasty and a banana, and I drank some Lucozade. Shaun however refused to eat. He was not feeling good at all. We cycled on to the garage on the way out of town and bought some chocolate. He at least ate that. We followed the same back road (which was once the A9) out of Aviemore and on to Kingussie and Newtonmore. My Aunt and Uncle live in Newtonmore, and Anne makes some excellent cakes. We stopped for a cup of tea and some cake and some cheerful company. 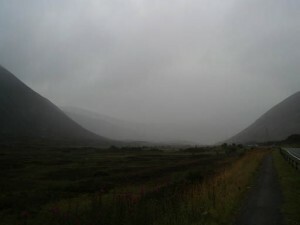 Then we bade them farewell and set off for Drumochter Pass. Still on route 7, we were mostly on traffic free road along side the A9. 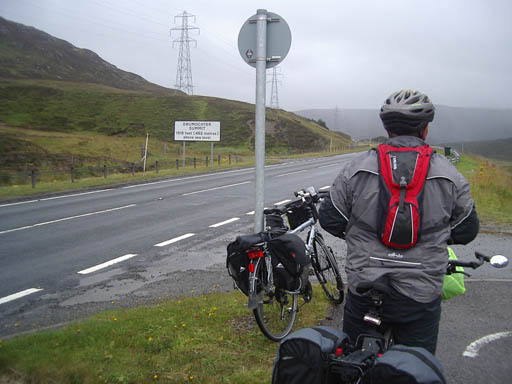 We cycled on through Dalwhinnie into a headwind, then joined the Drumochter Pass Cycle Path (“No food or drink for 38km” proclaimed the sign. “Weather can change without warning”. Such a cheerful sign). We set off along this path. I had been looking forward to it for several months now. So had Shaun. Unfortunately, the weather changed without warning (though technically the sign had warned us) and it started raining, and was very cloudy. Eventually we reached the top, but I don’t think Shaun really noticed. He was concentrating too hard on the square metre of cycle path below him. The decent off was certainly different. We descended for an hour, there was no headwind and no rain. The cloud lifted. Some of the path needs attention. Shan managed to hit a pothole, despite focussing so intently on the road, that caused a lump to appear in his tyre so large that by the next morning the wheel wouldn’t go round. We reached the campsite at Faskally 13.5 hours after leaving Dingwall. It was a hard day, but for one of us at least was quite enjoyable.